This video demonstrates the day and night infrared video surveillance capability of the DPRO-AS700 vandal-proof dome CCTV camera. In this video we'll test the DPRO-AS700 vandal proof dome CCTV camera. We are going to test to see how the camera performs normal light and zero light video surveillance situations. To test normal light surveillance, we initially have all of the lights on in the office. The varifocal lens of the camera is positioned at the widest angle which is the 2.8mm setting. This room is 21 feet long and I start walking from the furthest point in the room from the camera. I stop about 6 feet away. I turn the lights off now to test the zero light infrared surveillance. The camera switches to black and white / night mode and the infrared LEDs will switch on. I am going to turn the computer monitor off so that it is completely dark in the room and I’ll make my way to the back of the room again. Notice how the intensity of the infrared adjusts depending on how close I am to the camera. This feature is called smart IR. It adjusts the intensity of the infrared illumination so that images do not white out when they are too close and the intensity turns up when objects are in the distance. I will turn the light back on and the night vision mode disengages and the camera captures color video again. Here is some additional information about this camera. The AS700 uses the latest 700TVL Sony CCD image sensor. This camera works with all 960H and D1 format CCTV DVRs that have analog BNC video inputs. The 2.8 to 12m varifocal lens allows installers to adjust the zoom level during installation to get just the right angle of view. The 24 infrared LEDs have a maximum effective illumination distance of 90 feet and the built-in smart IR technology automatically adjusts the intensity of the infrared illumination depending on the distance that objects are detected. 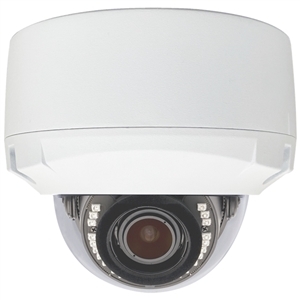 This camera is a great choice for both indoor and outdoor video surveillance systems. The enclosure is IP68 weatherproof which means that it can stand up to the harshest wet outdoor conditions. The housing is also designed to be vandal proof. The base of the camera is metal and the dome cover is a hardened polycarbonate plastic that is resistant to vandalism. The tri-axis lens mount allows this camera to me ceiling or wall mounted and adjust to any angle. For additional information about this camera, please visit this page www.cctvcamerapros.com/AS700. Click here to learn more about the DPRO-AS700 Vandal Dome Camera used in this video.